” Republican National Convention in Cleveland – Rousing Expectations from Donald Trump as ‘Doer’ ” – July 21, 2016. 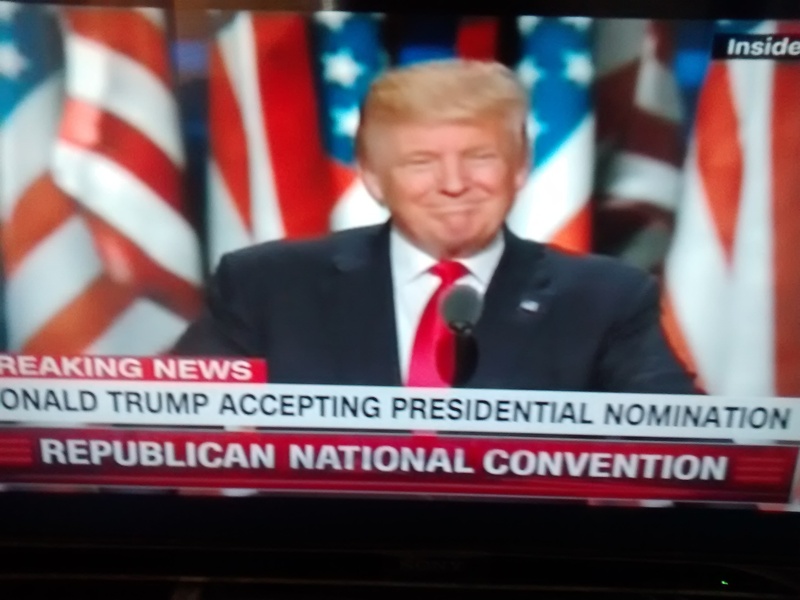 Donald Trump accepting Republican Presidential nomination. Donald Trump delivered a powerful acceptance speech full of promises and effective changes to the systems presently in place in Washington – sans specifics. The reception and reaction of the audience in the stadium – frequent applauses enlivening the atmosphere – resembled a situation where Trump threw ‘flowers’ at them often, while with pleasure they grabbed it willingly. The stadium can hold 10000 and more people; and Donald Trump spoke for an hour and fifteen minutes, the longest in recent decades. Donald Trump did not seem to fear any criticism being fully aware that many outside may not toe his line of thoughts; at the sametime strongly feeling that the audience in the stadium and those like minded enthusiasts outside in the country are the “Doers”, emphasizing that he will focus his efforts positively if and when he takes the oath of office of the President of U.S.A. Confidence personified ! 1. Donald Trump gave expression to his will to do what he strongly considers good for people if and when he takes the oath of office of the President with full realisation and memories of the words of Abe Lincoln : ” I desire to conduct the affairs of this administration that, if at the end, when I come to lay down the reigns of power, I’ve lost every other friend on earth, I shall at least have one friend left and that shall be down inside of me”. (Note: Lincoln’s statement, however, came after he became the President). A convincing and selfless stand, this is. 2. Donald Trump, while claiming that ‘he is the power behind the powerless’ and ‘he is the voice behind the voiceless’ – with the aim of lessening the influence of Washington on peoples’ affairs – he seems to be drawing attention to Gerald Ford’s : ” No more! We’ll make the decision about our lives. You protect us from foreign aggressors and domestic criminals ( Trump’s avowed aim of fighting ISIS/terrorists and defeating them); give us a stable currency ( Trump’s avowed aim of preventing currency manipulation by China and any other country); and give us an excellent Court of Law ( Trump’s avowed aim of appointing SC judges of impeccable credentials to uphold the constitution fairly and justly ); and we will do the rest.” – as the major demands of people. 3. Donald Trump’s strong conviction that nations in the realm of NATO, specially the Baltic states should share a fair crack of the whip, and in the light of America’s resolve to curb terrorist attacks at any cost, he seemed to invoke John F Kennedy’s words : ” Let every nation know, whether it wishes well or ill, that we shall support any friend; oppose any foe; pay any price; bear any burden; and meet any hardship in order to assure the success and survival of Liberty “. Donald Trump’s intent to work hard and persevere for the good of people may be seen in this term by many. 4. Donald Trump, while declaring that he is the ‘ law and order candidate’ seems to attribute importance to the words of Herbert Hoover : ” The first need of the nation, more urgent than even bread is ‘ law and order ‘ ; and the next imperative is to restore economic production ( recall Trump’s promise to bring maufacturing and jobs back to America); for the starving cannot long be supported on charity.” Good thinking ! 5. Donald Trump, while stressing upon the fact that his government will only speak the “truth” and “respect the hard work of people”, was possibly echoeing George M Humphrey’s words : ” We scorn panaceas; we respect the fortitude, courage, and the staying power of the American people. We show the respect by always speaking the plain “truth” , as we know it. We believe in the ingenuity and ‘hard work’ of Americans as the resources that no nation on earth can match. We believe in his capacity to work, to save, to invest, to sacrifice, to create, to dream good dreams, and to bring them to true life. To do all these things, the people need but one thing : a government they can trust, a government worthy of that trust”. Does Donald Trump imply this credo ! Yes, it would seem. In sum, there is something in his speech that may sound good for some; not so much for some others; and good for some (or many?) some other day and time as the fresh phase of the campaign begins. People will love to watch the sequel to the acceptance speech with interest and intense scrutiny, for sure. Friday, July 22, 2016 – 11. 59 a.m. (IST).